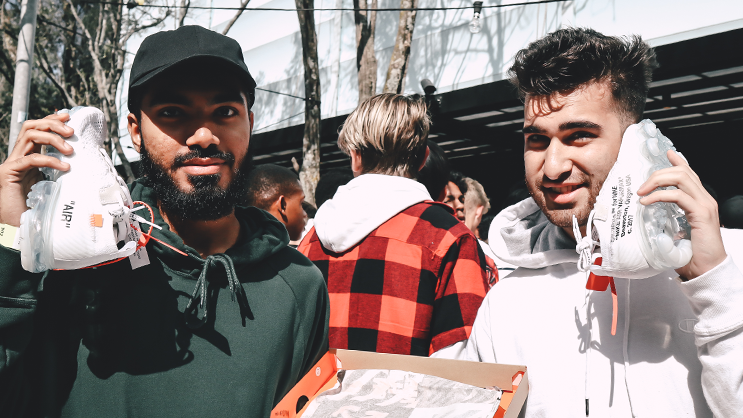 Here’s what went down at the launch of adidas Yeezy Desert Rat 500 “Blush” and Off-White x Nike Air VaporMax “White” at Shelflife (Rosebank). The newest YEEZY Desert Rat 500 “Blush” and Nike x Virgil Abloh’s Off-White Vapormax “White” made a debut this past weekend, releasing locally at Shelflife (Joburg and Cape Town). Part of YEEZY Season 6, the Desert Rat 500 “Blush” iteration features a neutral colorway on the upper constructed out of suede, leather, and mesh. Sitting atop of a chunky, thick AdiPRENE outsole, the sneakers include a vintage retro aesthetic. The ground-breaking Nike Air VaporMax X Off-White made a return this past weekend in white with a clean, translucent VaporMax Air-Sole unit, reflecting Virgil’s design ethos of simplicity and a raw material palette. For another exciting episode of our RELEASE REWIND, we were out at Shelflife Store (in Rosebank) to capture the behind the scenes of the release, and we have rounded up reactions from a few fans who got a chance to purchase a pair.